Chris lives in Salisbury, NC, with his wife, Molly, and their four children. Chris is a pastor, teacher/preacher, writer, leader, and ambassador in the community, whose heart is to mobilize and equip the local church to be the bridge-builder, barrier-breaker and change-agent it is meant to be, while being a people who are known by their love for one another. Perhaps this Easter Sunday you found yourself somewhere celebrating the Resurrection of Jesus and the fact that the tomb is empty, that Jesus is alive and is risen so that we might have life. (However you celebrated this past week, I hope it was rich in meaning for you.) Easter brings with it a time filled with deep significance and celebration for Jesus-followers, reminding us of the purpose of Jesus’ life, death and resurrection, but also reminding us of our purpose as His followers. Central to our understanding of what it means to be a Christian (a Jesus-follower) is found in the familiar words of John 3:16. There, we are told that God has given…He has given us a Gift, and that Gift is His Son, His One and Only, the Only Begotten, Jesus. And that through Him, He gives the gift of abundant, everlasting life to all who believe. Also central to the Scriptures is the act of thanking God for this gift: be thankful (Col. 3:15); give thanks… (1 Thess. 5:18); enter His gates with thanksgiving… (Ps. 100:4). We are encouraged/commanded through Scripture to give thanks for this Gift of life that God has given us through His Son Jesus. And that in itself is our reason to celebrate on Easter. The Greek word for thankful is transliterated Eucharisimi (or Eucharistia or Eucharisteo) meaning to give or grant a good gift or grace. This is where we get the word Eucharist, which is another word we have for The Lord’s Supper or Communion. If you celebrated Easter with a church-community recently, you more than likely observed The Lord’s Supper, or Communion. 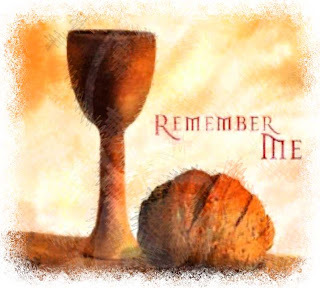 As Christians we meditate and reflect on this gift and what it means to us through by periodically taking of the Lord’s Supper, or Communion, otherwise known as the Eucharist. It’s our way, as commanded by Jesus, to remember His body that was broken and His blood that was poured out so that we might have life…and to be thankful. Yet, I think there’s a deeper, richer purpose that goes beyond simply taking of the bread (symbolic of the Body of Christ) and the cup (…the blood of Christ), to becoming. In other words, there is a call for those of us who follow Jesus to become to the world what Jesus is for us…broken and poured out so that others may have life. Think about it, What would be missing, what good would be lost if we, or our church were no longer in the community God has placed us? At the heart of the Awaken Community is the desire that we would be a Eucharist to the city of Greensboro and the world, broken and poured out, so that others would find life, wholeness and goodness in Jesus – through His Church.As you move beyond this Easter, may you find yourself being to the world and the people around you what Jesus is to us. May we all be the life-givers that our neighbors would eventually be grateful for.